If you haven’t been able to tell before, we love pizza. If it’s good pizza, we wouldn’t mind eating it every day. It’s always fun to try new variations on the classic pizza (even though that doesn’t need much improvement). So, here is our latest pizza creation: a crisp pizza crust topped with a super simple homemade sauce, roasted red peppers, spinach, feta, and fresh mozzarella. 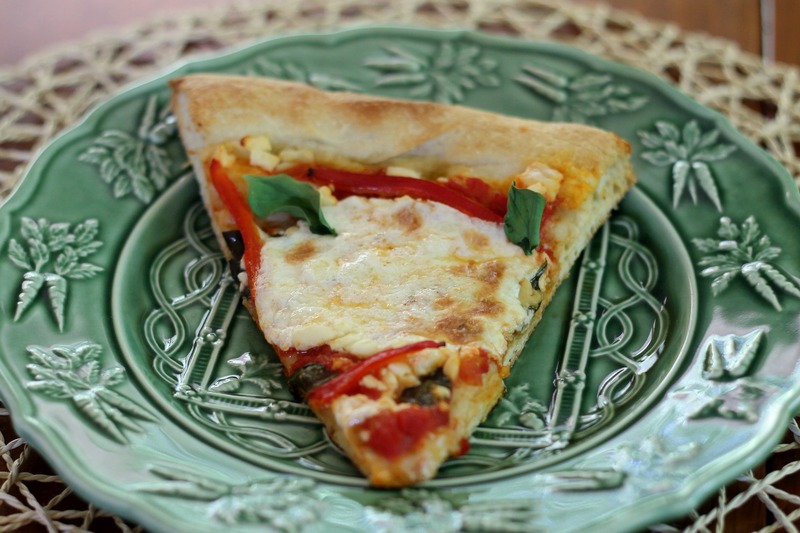 In taste, it kind of reminded us of a Greek pizza from The Fresh Market, minus the olives. Homemade is (almost) always better, so the homemade version of this pizza will win every time. Give it a try- it is easy and super delicious. P.S. As of today we have two weeks left of school! Not to be those annoying “summer please come” people, but we can’t wait! And to be seniors next year, of course! Pulse 4 cups of the flour, yeast, and salt together in a food processor until combined, about 5 pulses. With the food processor running, slowly add the oil, and then the water. Process until a rough ball forms, 30 to 40 seconds. Let the dough rest for 2 minutes, then process for 30 seconds longer. If the dough seems to sticky and clings to the blade, add the remaining flour 1 tablespoon at a time. Transfer to a lightly floured counter and knead into a smooth ball. Place the dough in a large, lightly greased bowl. Cover the bowl tightly with greased plastic wrap and let rise at room temperature until doubled in size, 1 to 1 1/2 hours. Heat the garlic and the oil in a saucepan over medium heat. When the garlic begins to sizzle, add the tomatoes. Bring to a simmer and cook until sauce is thick enough to mound on a spoon, about 15 minutes. We used diced tomatoes, so it took a little longer. Season with salt and pepper to taste. Preheat the pizza stone in a 500-degree oven for at least half an hour (preferably an hour- let it heat while your dough rises!). Roll out half of the dough on a piece of parchment paper that has been lightly sprinkled with cornmeal. Top with about 1/2-3/4 cup of sauce. Sprinkle with half of the spinach. Arrange half of the pepper slices over it. Top with the mozzarella rounds and feta crumbles. Brush the crust with olive oil. Using a cutting board, slide the pizza onto your heated stone. Bake until the crust is golden brown and the cheese is bubbly, about 8-10 minutes (it may take longer if your stone is less hot). Enjoy! We love making homemade pizza! And I love finding new recipes with new toppings. Feta + spinach + roasted red peppers – sounds and looks SO good. Thank you! Homemade pizza is the best, isn’t it? Fun to make and eat! Homemade pizza is the best! And I am loving the toppings on your creation. Thank you! We love putting fun toppings on our pizzas! Thank you so much! I just found your blog, and I was super excited to join your link party and find some new recipes! I hope you enjoy it! I will definitely check out your blog!